Can I Leave a Laptop Running All the Time? - Ask Leo! The short answer is: yes, it’ll handle it. Mine are typically on 24 hours a day, 7 days a week. The standard way to keep a laptop running at all times is to leave it plugged in … all the time. The battery never runs down, so the laptop never needs to shut down. But the problem is that the battery never runs down. In fact, the battery rarely dips below 99% of its charge. It’s basically kept fully charged at all times. In and of itself, this isn’t a problem. Your computer and your battery will continue to operate just fine. You may just find out that when you do take the laptop with you and run it on battery, 100% charge doesn’t mean what it used to. By leaving your laptop plugged in all the time, you’re making a decision to shorten the battery’s life: both the amount of time it can run your computer when not plugged in, and its usable life before needing replacement. I want to be clear: all batteries die. Eventually, they lose their ability to hold a charge, or as much of a charge, and they become less and less useful to power the laptop. 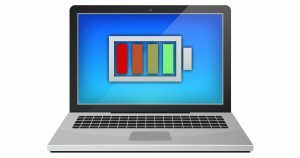 On my oldest laptops, for example, the battery acts as nothing more than a glorified UPS, and can keep the machine running for only a few minutes. Keep it ~80% charged if you can. Use it down to the 10% range. Use a charger that is matched specifically for the battery. Don’t let it get too hot or too cold. There is much controversy around the specifics of that list, so don’t take it as gospel by any means. The specifics also vary dramatically based on the battery type, how it was built, and even the software that controls how it gets charged. One thing most people agree on, though, is that keeping the battery 100% charged at all times is generally not ideal. It’s not disastrous, and your battery generally won’t die quickly — it’ll just die somewhat more quickly than if you’d treated it differently. So, it remains a valid choice. I leave my laptops on 24×7 so as to keep them automatically updated and run backups and other scripts at night when they’re not in use. It’s a choice I make. What I’ve found is that by the time I care about the battery life being too short, the laptop itself has generally fallen into disuse by virtue of having become “old technology” in comparison to newer machines. In other words, the battery’s lifespan still exceeds the laptops’ useful lifespan for me. In at lease one case, I was able to extend the life of one of my older laptops by replacing the battery before I loaned it to friend with less extensive computing needs. Turn it on occasionally, long enough to do whatever, with occasionally lengthier times to allow it to update. Plug it in when it gets low. Turn it on in the morning, turn it off at night. Travel with it as needed. Plug it in when not travelling. Or you can be like me, and leave it plugged in and running day and night, taking it for travel occasionally. How Can I Keep My Laptop Running with the Lid Closed? 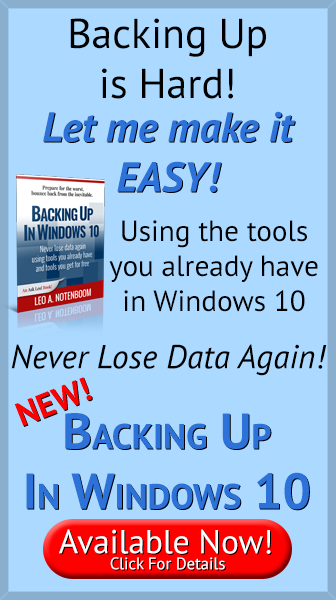 - The default configuration for most Windows laptops is to go into standby when the lid is closed. We'll look at how to change that. 1: A good thing, too, because the MacBook’s battery is almost impossible for mere mortals to replace. « Previous post: What Information Should I Provide When Asking for Help? I run mine off mains power at home all the time, but with the battery removed. Occasionally, I run it on battery for a couple of discharge-recharge cycles. Like Leo, mine stays on 24/7, mostly in hibernate mode. I have a cheap notebook computer driving my recording studio. It replaced a very old netbook that finally died after running 24/7 for 6/7 years. In Hibernation mode. the computer isn’t running at all. The contents of RAM are saved to disk and the computer is completely turned off. Waking from hibernation turns the computer on, but instead of starting your programs from scratch, RAM memory is loaded from hiberfil.sys saving a lot of time. There ought to be a software solution for ultimate battery life, keeping the charge level at 80% or 50% or whatever current battery science determines will preserve things when the laptop is always plugged in and periods of battery only use are not anticipated. Or is there a setting already in Windows? or does it not really matter any more? I know Teslas have a software setting so that you can specify the % to charge the battery up to. Why that’s not more commonplace in laptop computers I don’t know. Windows certainly has no option like that that I’m aware of. When did Microsoft ever give us options that really mattered. Except for trivial stuff it has been a one size fits all. Can’t remember the details, but one of our laptops noticed our habits and suggested we change to a setting which only charged the battery up to 60% I think it was. So yes, the technology is built in to Windows already. It could be the software supplied by your laptop’s manufacturer doing that. Laptops usually come with extra management software. Are you sure it was Windows? That sounds more like a manufacturer-specific (laptop specific) behavior. I’ve never heard or seen it in Windows itself. But I’ve been wrong before. You are correct. It’s NOT a feature of Windows but a manufacturer-specific one. I had a Lenovo laptop that had the same feature built into a software provided by lenovo. It stopped charging the battery when it reached 60%. I have two that are running 24/7. I set them to ‘do nothing’ when the lid is closed. This turns the display off, but leaves them running. My latest laptop doesn’t get to see its battery unless I’m going on a trip. Otherwise, I run it dead and store it in a cool dry dark place. So far, I’m getting like-new performance from a 4 yr old battery. Older versions of Windows need to be restarted to finalize updates. I tell my clients to turn off or restart once every two weeks…sooner if they wish. The article implies (but does not say) that it is OK to leave a computer on all the time. I advise my customers to turn off or restart their computer every day. Example: Had a business call and say they could not get some new software to install. I went out and installed the software and the computer wanted to reboot to finish the installation. OK no problem, OOps the computer would not restart, all I got was a blank screen. Asked customer when they restarted the computer last time, answer was. the last time I was out there, about 6 months ago. So this is the issue as I see it, at this point I have no idea why the computer would not restart, was it because of the software I installed or was it something that happened 6 months ago? If that computer was restarted/rebooted everyday I would at least know where to begin, now I have a 6 month windows and not a real clue where to start. To be a little nit-picky, turning off the computer and rebooting the computer are two different things. For example if you routinely reboot your computer (something I know can help – it’s tech-support advice step 1 in so many cases), you’re not turning it off to do so. Just to be clear, are you saying that rebooting a computer vs turning it off and then back on does not accomplish the same thing, the reloading of the OS? A restart is very similar to turning it off and on in that the OS is reset in both cases. A reboot doesn’t usually turn off all power and may not reset all the hardware. Surprisingly, no, not quite. They both cause the OS to reload (with caveat that Windows 10 “fast boot” causes it to act more like a recover from Hibernate than a true reboot). But a power-off resets all the hardware as well, in ways that a simple reboot sometimes does not. That’s why some technicians won’t have you just reboot, they’ll actually have you shut down and power off, wait a few seconds, and then turn it back on again. I bring my work laptop home and normally use it plugged in. Next morning I go back to work with the battery at 100% and don’t plug it in until the low battery warning sounds. Then it remains plugged in for the rest of the work day, unless I have to unplug and take it to the conference room for a meeting. Most days I also do a Restart before I leave home or when I reach the office. Very surprised every comment only focused on battery life. What about the effects of dust being sucked inside the computer that’s running 24/7? I take the covers off all my computers & blow them out with compressed air. You’d be amazed how much dust accumulates inside from the cooling fans. And mine never run 24/7! With the inside filled with dust, it is harder for the computer to cool itself, causing higher op. temps & quicker component break-downs. I find this article most helpful as I always find all of his articles. I have a question, when I’ll buy a laptop (because I got tired of the heavy CPU desktop and because it got too old anyway) is it possible to run it with electricity only – that is, without battery at all, just plugging it on the wall? Thank you very much. Most laptops can run without the battery but you’d have to check that before purchasing. Lately more and more laptops have difficult (or nearly impossible for the average person) to remove batteries. Is there any issue with hacking or scammers getting access if I leave my laptop on 24/7? Not if you have good security in place. All my computers are on 24/7. As you stated sooner or later all batteries dies, there is just something that we need to do, such as, let last the battery than fully charge it time to time. “Keep it ~80% charged if you can. I kind of feel like im hatching an egg!